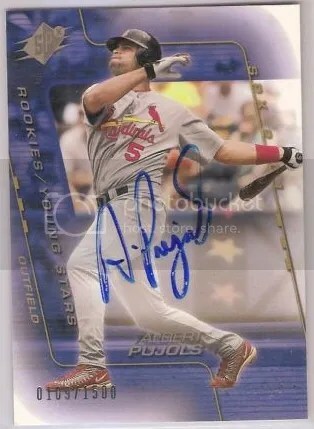 When 2001 Bowman Chrome Baseball was released, this card was only made available through a redemption. At the time, nobody had any idea this card would amount to what it is today. 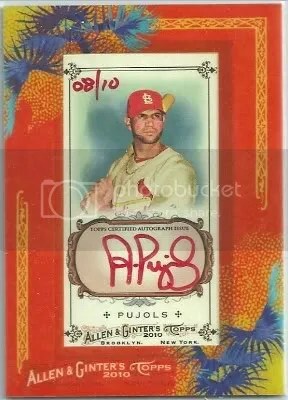 While attending card shows, I still have to chuckle when I see a dealer trying to sell a box of ’01 Bowman Chrome trying to convince people they have a chance of pulling the Pujols rookie. They lack to inform people that redemption has expired. Albert Pujols is having a great season and his rookies are on fire. Browsing eBay you’ll find tons of his cards selling for huge amounts. 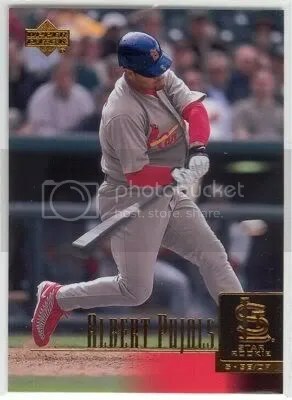 But there is one thing that really makes my piss come to a boil and that when sellers try to pass off the card below as a true Pujols rookie. 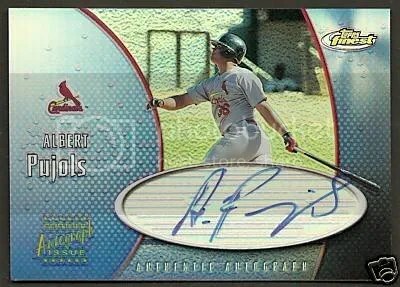 This card comes from a retro set made back in 2006 and was given to shop owners during a “Rookie of the Week” promotion put on by Topps. 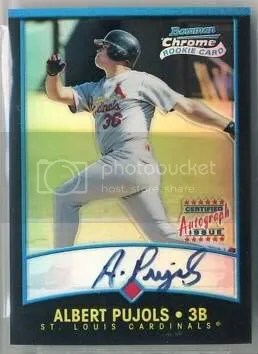 Yes it says “Rookie Card”, but thats far from what it really is. The only good thing is that they haven’t been selling for much. The highest one I found sold for $8.99, but thats not the point. Collectors really need to know what they’re buying. I like how it says “Late Addition” in the upper right corner. That is a late rookie, about five years late. 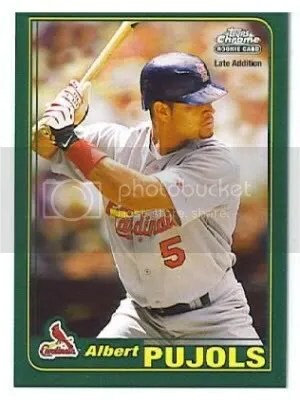 This Albert Pujols card was brought to my attention over at Card Informant. 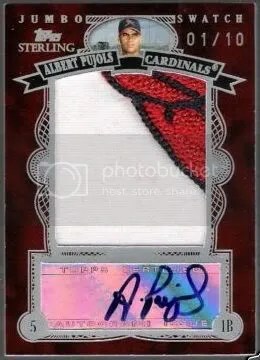 Take a look at this Pujols patch. Looks pretty cool doesn’t it? There is just one problem. 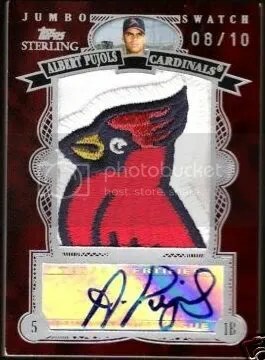 The patch isn’t an authentic patch worn by Pujols. The stitching is totally different from that of a real one. These patches can be purchased by anyone. The red on this patch has the tight little sewing circles that you normally would see on a Cardinals patch. I have reported the auction and I guess we’ll see if eBay takes it down.